Cook rice in 2 cups of the water as directed on package. In 3-quart saucepan, heat oil over medium-high heat until hot. Add curry powder, salt, cumin and ground red pepper; cook and stir 1 minute. Add onion and garlic; cook and stir 1 minute longer. Add potatoes, carrots, bouillon cube and 1 1/2 cups of the remaining water. Heat to boiling. Reduce heat to medium; cover and simmer 10 minutes. 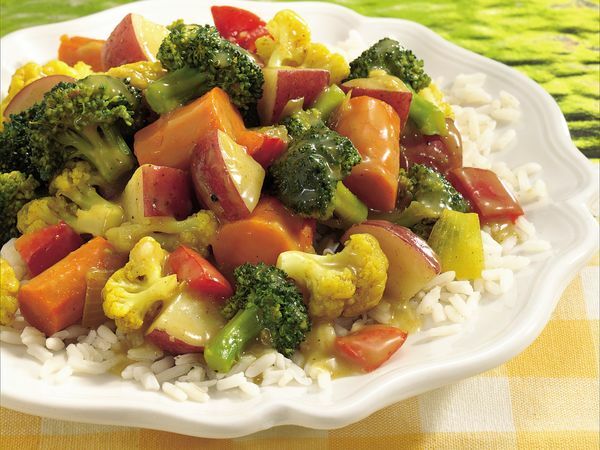 Add broccoli, cauliflower and bell pepper; cover and simmer 4 to 6 minutes or until vegetables are crisp-tender. In small bowl, mix remaining 1/4 cup water and the flour until smooth. Add to saucepan; cook and stir over medium heat until mixture boils and thickens. Boil and stir 1 minute. Serve over rice. Make this dish heartier by adding 2 cups chopped cooked turkey or chicken.